UltraSeps v2 is 100% compatible with Photoshop CC 2015 although there's a few things you should know to get up and running as CC 2015 is very buggy and there's a few issues that can affect color separations and other third party software. If using Photoshop CC 2015, we advise downloading the latest version from Creative Cloud which is currently Photoshop 2017 or later. After doing so, download a new installer and run it with Photoshop closed to make sure the UltraSeps plugin is installed to the new version. Then launch the new copy of Photoshop and load the UltraSeps Actions followed by running the Action to load the Color Settings. Overall, Photoshop CC 2015 has some issues with automation. If affected, we have listed solutions below. Another alternative is to download a previous or newer version of Photoshop. such as Photoshop CC 2017 or higher, see This Page. The Command Move Is Not Available when running separations. 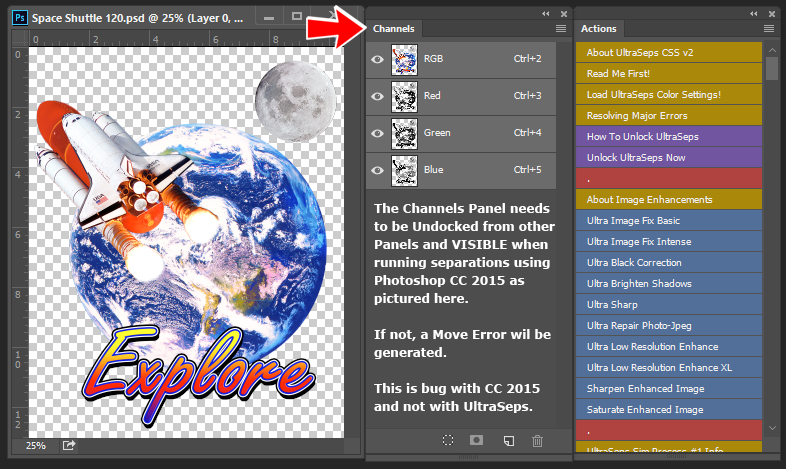 To resolve, the Channels Panel needs to be undocked from any other Panel within Photoshop and be floating all by itself. Or if docked with other Panels, the Channels Panel needs to be the top visible Panel. For an example click here. When running separations with UltraSeps using Photoshop CC 2015, some of the white underbase and highlight white channels may not render correctly. This is a bug with CC 2015. Running our Repair CC 2015 Action resolves this abnormality and after doing so, all separations will render correctly. Its important to note that if ever resetting the Preferences due to some other issue, this Action will need to be run again. Therefore, if separations don’t appear correctly with odd looking underbase whites and dark highlight whites with ink where none should be, simply run the Repair CC 2015 Action to fix. The Action will prompt you to open the Space Shuttle sample file included with the Action. Its also included with UltraSeps. To use, simply load the Action into the Actions Panel of Photoshop and run. A screenshot of the issue can be seen here. A comprehensive video is available here that provides an example of the issues above both before and after the simple fix. When running the Custom Register Marks feature of UltraSeps with CC 2015, the marks will appear blurry. The reason for this is a bug in which Photoshop CC 2015 handles Custom Shapes. This issue has been addressed by Adobe beginning with CC 2015.5 and all versions going forward. The Preferences File generated by Adobe Photoshop CC 2015 is not as stable as those with earlier versions and can be damaged. I've seen color separations render with solid channels after repeated and very heavy usage of automated software. If this problem ever appears, simply follow the simple instructions on resetting the Preferences here. After doing so, remember to run the CC 2015 Repair Action above to resolve possible issues with the white highlight white and underbase channels. When installing Adobe Photoshop CC 2015 to your system, Adobe has decided to automatically remove all previous versions of Photoshop CC during the process leaving the end user with CC 2015 only. Installing CC 2015 does not remove any version of Photoshop CS6 or lower. If wanting to retain your previous installations of Photoshop CC, which I highly advise as some other plugins, filters and extensions may not be compatible with the latest release, select the Advanced Options in the Creative Cloud Update and uncheck Remove Old Versions. If previous Photoshop versions have been removed automatically and you'd like to recover them, its possible to download versions back to CS6 from Creative Cloud. See this page on how to download previous versions of Photoshop. If installing Photoshop CC 2015 to your system after UltraSeps has been installed and unlocked previously, the UltraSeps Plugin and English.data file will also need to be copied to Photoshop CC 2015 in addition to the UltraSeps v2 Actions loaded into the Actions Panel of the new Photoshop. Just loading the Actions and Color Settings does not make UltraSeps functional with the new copy of Photoshop CC 2015. The full installers have been updated to support Photoshop CC 2015 as of 6/20/15. So just download a new installer and run it with Photoshop closed so the plugin gets installed to it.